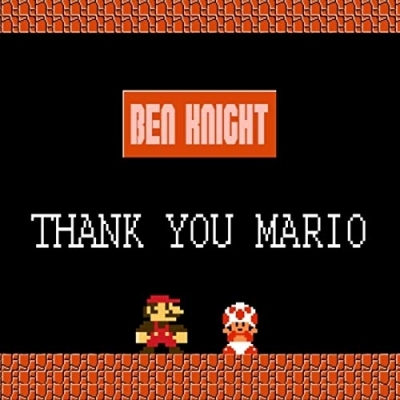 Nerdcore Hip Hop artist Ben Knight has released his latest single, 'Thank You Mario'. The quirky artist says of the new song, "Ever wanted to know what Mario thought about his predicament in Super Mario Bros for NES? Now you do." Ben Knight has been making a name for himself the last couple of years as a pop culture hip hop artist, and once you hear him it’s not hard to see why. Following the trail blazed by artists like MC Lars, MC Frontalot and Megaran, Ben has his own approach to hip hop that really stands out. He writes songs that embrace the heavily pop culture influenced world we now live in but also has the innate ability to appeal to an extremely diverse audience. Taking influences from the past and the present in the genre of hip hop, there’s also a sense of finding the right hook to his songwriting. With a unique but commercial sound, he finds a way to tap into interests without leaving anyone out. Seeing him live is an entirely different experience. The affection he has for the audience is evident before he’s ended the first song. In the constantly growing and evolving hip hop landscape, he is a welcome addition to the genre. There are already so many hip hop/rap artists out there and I wanted to stand out. My thought was to take the production and music seriously but make all of the lyrical content satirical. All my songs are on the lighter side of things (Harry Potter, Back to the Future, Peter Pan, Nintendo, etc) but when I'm behind the mic I want to entertain and give people a good show. That being said, when I have a mic in my hand, I also need to share the love of Christ and how He's changed my life."